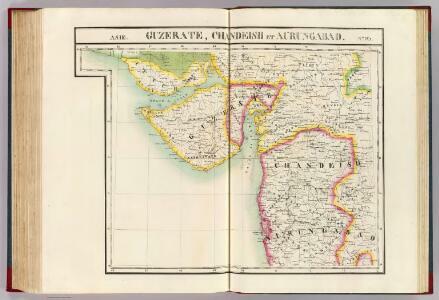 Watercolour with pen, pencil and ink by an anonymous artist of a map of the coast between Cambay and Surat dated sometime between 1789 amd 1820. The image is inscribed with a scale and pencil notes. Cambay is situated to the north of Surat on the coast of Gujarat. Cambay, at the mouth of the river Mali, was an ancient port for the city of Ahmadabad. In 1613, the English set up a Factory in Cambay but the port was overtaken by the rise of Surat as a trading centre and later by the silting up of its harbour. Surat, on a bend in the river Tapti, was an important Mughal trading port from the late 16th to the late 18th centuries. Although Dutch, Portuguese, French and English merchants were permitted to trade in Surat during the 17th and 18th centuries, by the late 18th century the English had complete control of the port. In 1837, due to fire and floods, the town's trading base declined significantly and many Parsi and Jain merchants moved their businesses to Bombay which later surpassed Surat as the west coast's premier port.